I don't know about the newer guitars but I have an '89ish black HB-35 and I love it. I bought it new back in the day and still play it regularly. I have replaced the bridge/saddle when it developed cracks, and I have replaced the stock pickups with Stew-Mac's PAF reproductions, "Golden Age Humbuckers" I think. I much prefer their sound over the stock pickups but personal-preference and all that. Neck is lovely, action is great, it is pretty heavy but it sustains for days. If the one you are looking at is in reasonable shape then I would highly recommend grabbing it. If it matters, I am mostly a blues player these days and the guitar suits me perfectly, but if I venture into lighter and heavier territory the Washburn sounds nice there too. Some other differences from my 01 HB-35 The body cutaway cavities are smaller than the 01, the pickup selector switch is mounted near the v/t controls, the output jack is mounted on the front also near controls. The label inside the body is a small white oval with black test. The <i>f</i> holes are smaller and a different shape from the 01, the Washburn headstock logos are different. on this guitar it is more compressed letters where on the 01 the letters are wider and a space between the W a W ashburn and there is the circled R directly behind the logo. No BFTS on this guitar where the 01 is marked with a BFTS label. The truss rod covers are slightly different, the corners of cover on the guitar in question are nipped 45 degree angle on the nut end, the HB-35 is vertical letters and slightly larger than on the 01 which has slanted letters. The pickguard is larger and a different shape. 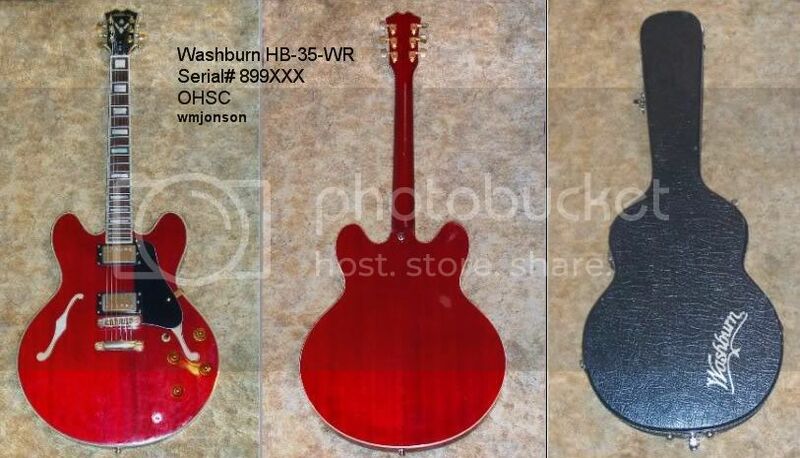 Considering the above, this guitar is a slightly different design than the 01 HB-35. 1989, Made in Korea by Samick. Probably late 89 since they still used the old headstock on some that year. Same as above. 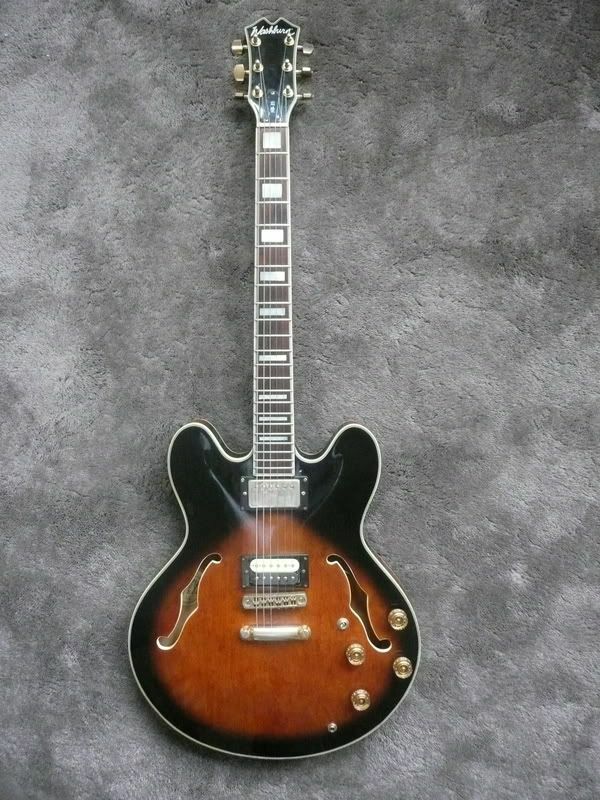 And you'll notice there are many similarities with the Epiphone Sheraton (especially yours, with the same finish) because Samick also made those at the time.